What’s a bird to do when approached by a company asking if she would like a personal chef to come and cook dinner for her and some friends? Say “heck, yes! !” of course! La Belle Assiette is an online private chef experience that has over 300 chefs nationwide and every manner of cuisine to choose from, including Nordic and Nepalese. There are three tiers of experience to choose from: Temptation at £39pp (which is what we had), the Prestige gourmet experience at £59pp, and the Michelin quality Signature experience from £89pp. When we were doing our research, His Nibs and I counted 3426 menus by over 300 chefs, so there really is something to suit every taste, dietary requirement, and budget. 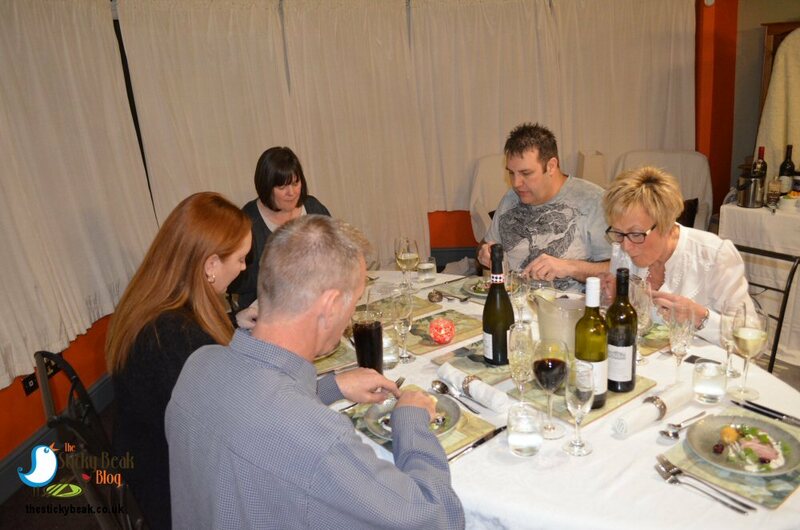 When you hire a La Belle Assiette chef, there literally is nothing for you to do except relax with your guests and enjoy the food; our Chef, Karl Tyler, brought pans, pots, crockery, cutlery, and food - in fact everything except the proverbial kitchen sink! 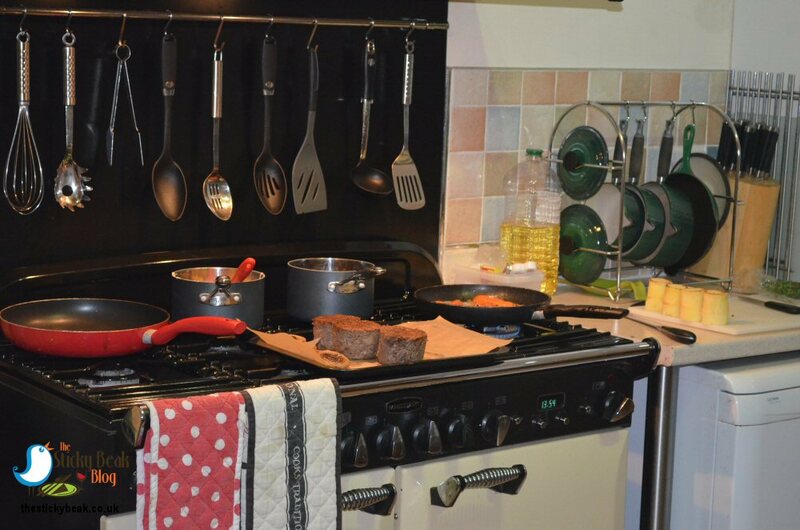 I am just going to point out that my kitchen is nothing fancy or exceptional; it’s just your average version, although we perhaps lack counter space that more modern kitchens have. 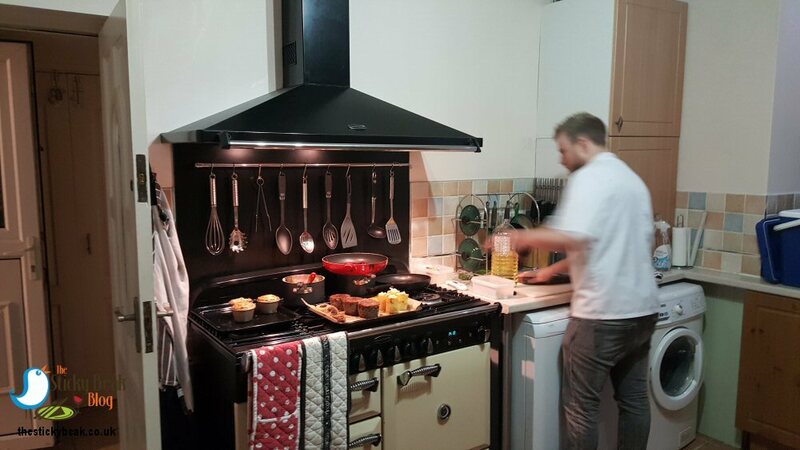 Chef Karl brought all his stuff in, familiarised himself with our cooker, and cracked on with absolutely no fuss at all. Our guests arrived and we sat quaffing bubbles, chatting excitedly about the evening ahead, and twitching our noses at the delicious smells emanating from the kitchen. Before long, Chef announced that the first course would be served shortly, so we went through to the dining room and took our seats. 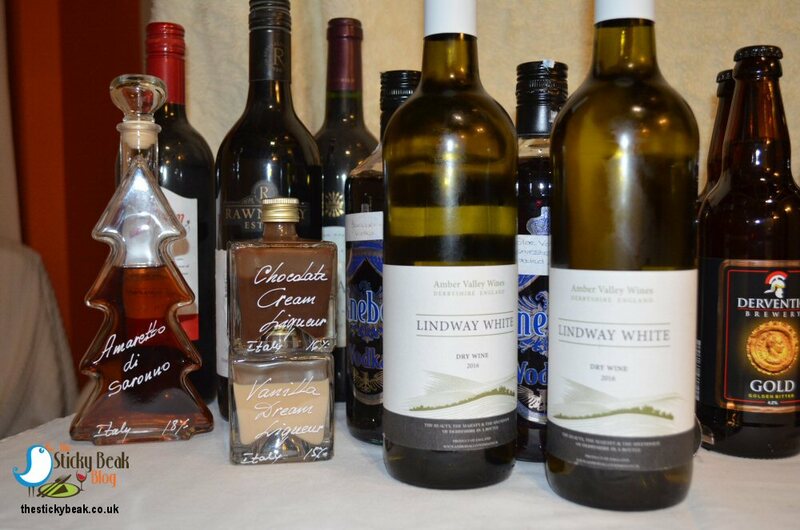 The Man Bird played the role of sommelier for the night and poured Amber Valley Wines Lindway White 2016 vintage for everyone to savour alongside the first course of Tea smoked Duck breast, Crispy Quail egg, pickled Blackberries, Red vein Sorrel and Goats Cheese. A couple of our guests aren’t especially drinkers, and certainly not of wine, but they were very enamoured with this award winning little number from a local vineyard; the 2016 vintage of Lindway white has just won a Commended award from the International Wine Challenge. You can buy this online from www.ambervalleywines.co.uk, if you want to sample it for yourselves. Anyhow, back to the food. 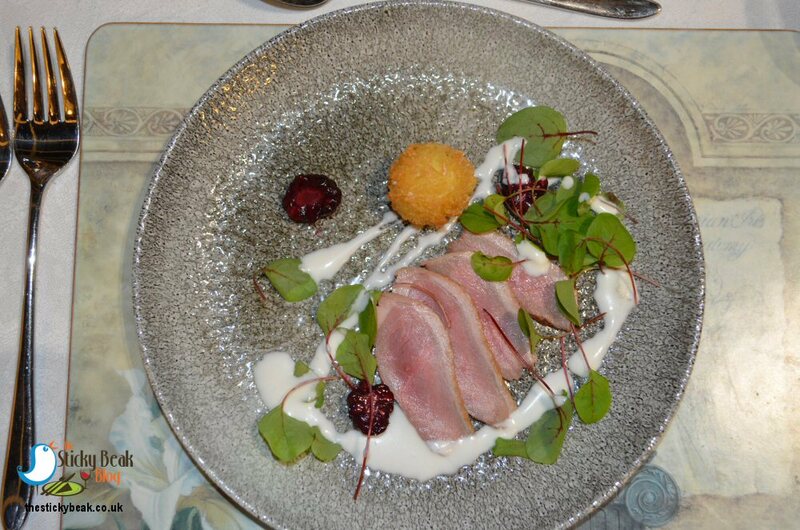 Without exception, everyone absolutely loved this starter; the duck had a delicate tea note to it that was lovely and light on the palate and the richness of the Quail egg was gorgeous. Sharper notes from the Blackberries and the Goats cheese ensured that it was well balanced dish, and the crispy coating on the egg gave a nice texture to this first course. One of our couples had thoughtfully brought a bottle of red with them, which we had opened on their arrival to let it breathe a little. 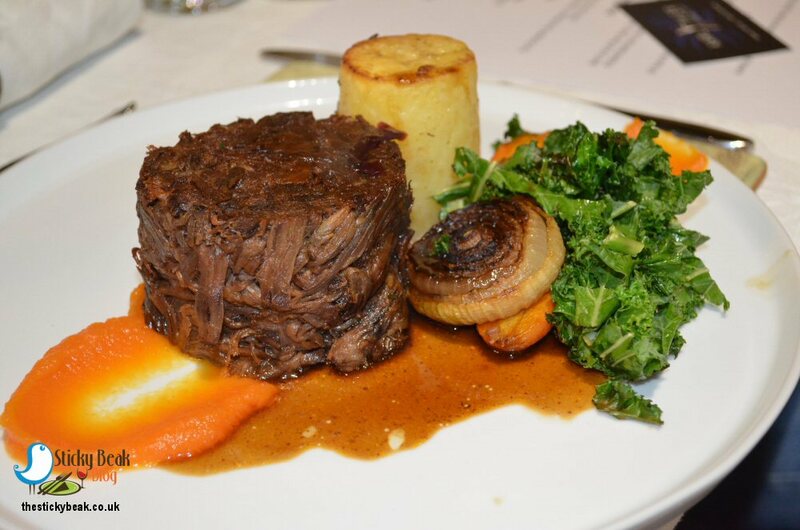 As we had all opted for main courses of red meats, this medium bodied bobby-dazzler hit the sweet spot perfectly. 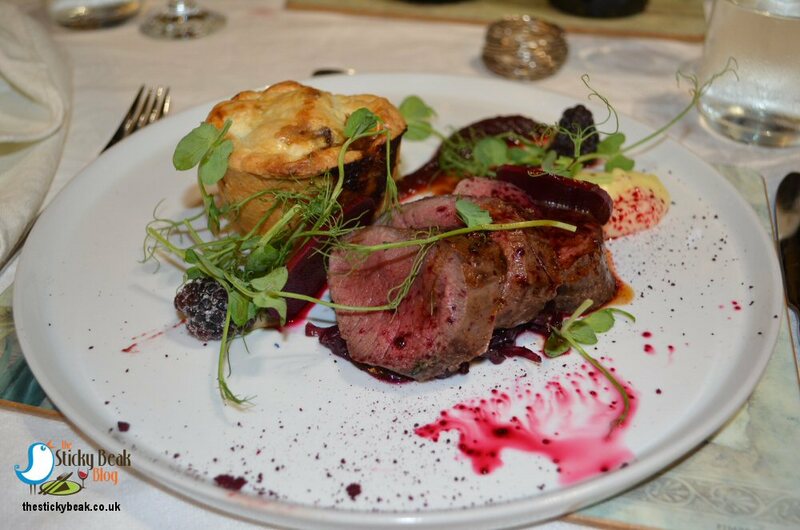 Half of the party chose to have 14-hour braised Feather blade of Beef with braised Potato, burnt Onion, Carrot, Kale, and red wine glaze; the other half had selected best end of Roe Deer, and slow cooked Venison “Gamekeepers Pie”, with spiced Red Cabbage, pickled Beetroot, Beetroot powder and puree, macerated Blackberries, and Pea shoots. The table fell silent as we all tucked into our main courses, and having taken her first mouthful of the blade of Beef, one of the guests remarked that “it was so good, she could cry with joy”. 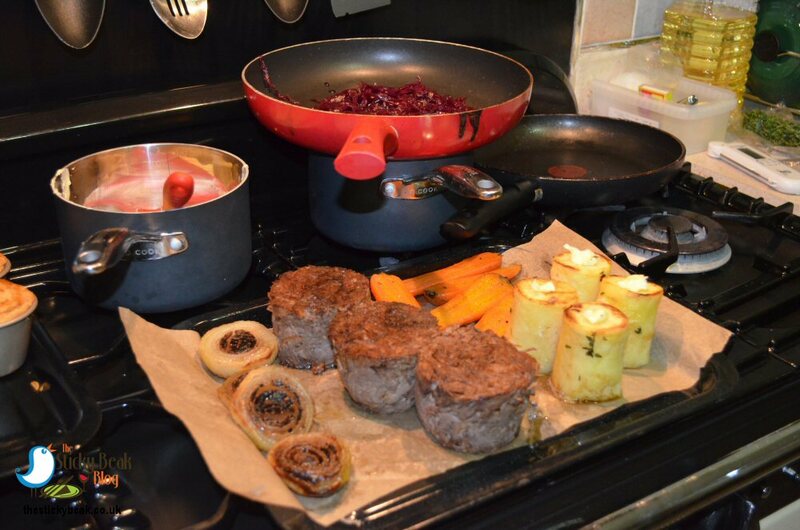 The beef was melt-in-the-mouth with a beautiful deep, rich flavour to it and all the vegetables were cooked to perfection. A sweetness was provided by the burnt Onion, along with the obvious smoky note. Earlier in the evening I had been watching Chef Karl Tyler cooking the carrots, and as they simmered in generous amounts of butter I was sorely tempted to pinch one! Kale always gives a fresh, bright taste in the mouth and provides a satisfying “chew-time”, so that you can’t just wolf it down – perfect for gannets like me! Slices of medium-rare Venison loin had that superb gamey-earthy taste characteristic of it and sat on top of a bed of warmingly spiced red cabbage. 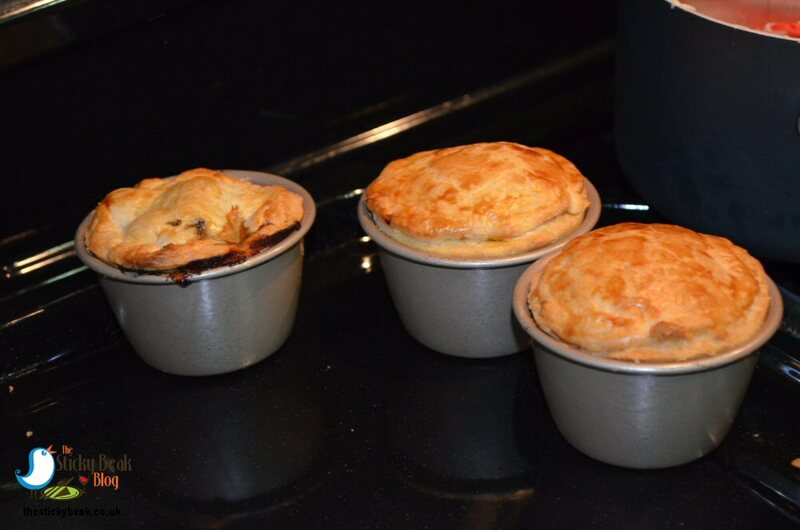 As the individual Gamekeepers pies were cut into plumes of steam emanated from them and a wonderful smell wafted over the table. The pastry itself was lovely and buttery, not at all tough, and the meat inside was incredibly tender. What grabbed the attention of those eating this dish was the simply amazing concentrated flavour of the Beetroot powder; the merest pinch of it was as if you’d eaten an entire bunch of this vegetable, and “stunning” was how one guest summed it up. The pickled Beetroot and Blackberries kept the palate on its toes, as did the crunchy pea shoots. 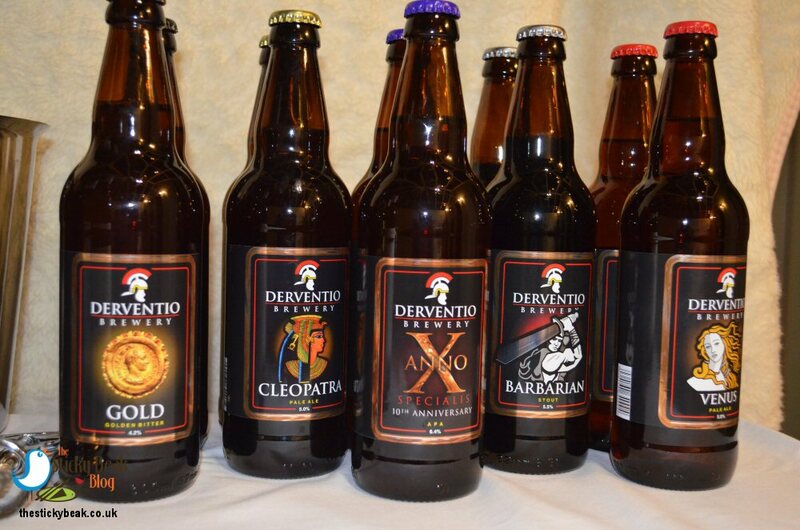 Another local business, Derventio Brewery, had very generously given us a selection of their pale ales, bitters, and stout to drink throughout the evening. You may recall that I had previously been on a tour of this micro brewery and raved about their products, so I was delighted that my guests would be able to sample them too. An unfortunate technical glitch prevented pudding being served; but in all honesty everyone’s tummies were full at this point anyway. The saying goes that every cloud has a silver lining so in the absence of a food dessert, we had a liquid pud instead, courtesy of the other couple attending the soiree. Now for those of you that don’t know, I am rather partial to a Gin or two, so imagine my absolute joy when I unwrapped a bottle of 57.2%abv Edinburgh Gin! The first thing to do was try a sip or two of it neat, and wowsers it was good. I and another guest were taken aback at its power, but the real winning point was the roundness this Gin had; sometimes there can be harshness to such high abv spirits, but Edinburgh Gin is gorgeously smooth. As we all sat drinking, laughing and indulging in general tom-foolery, Chef was tidying away in the kitchen. No word of a lie, it was as if a magical cleaning fairy had been in the kitchen. 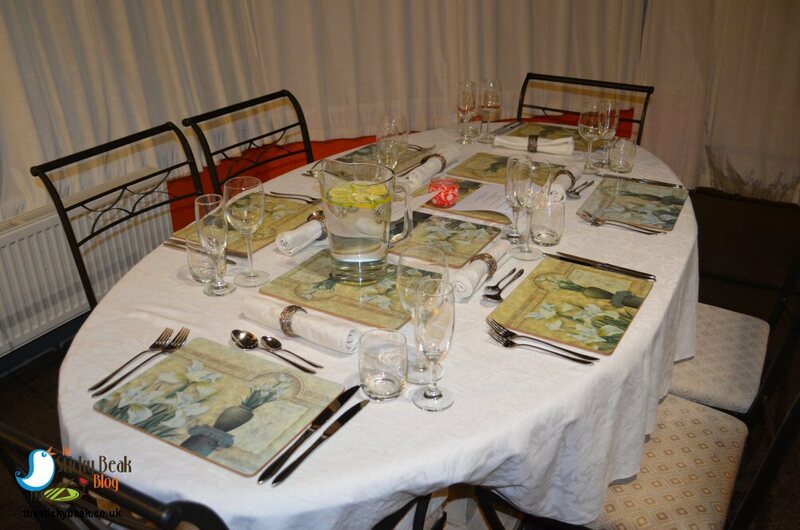 Literally every surface sparkled; no-one would ever believe that a meal for six had been prepped, cooked, and served in there - unless they’d witnessed it for themselves. Karl bade us all goodnight, drinking in all the praise we were heaping upon him, and rightly so because he hadn’t stopped all evening. Champagne truffles, liqueurs and freshly roasted coffee were in order to round things up. Il Gusto had provided us with Amaretto di Saronno (in a festive Christmas tree bottle), Vanilla Dream, and Chocolate Dream tipples and ice-filled glasses clinked away merrily as they were tipped up and drunk from. One guest even had some of the Vanilla Dream liqueur in his coffee, and it was heavenly. Personally, I love the Amaretto from Il Gusto as it isn’t cloyingly sweet and you get a real Almond flavour in the mouth. 47 Degrees coffee is a Heanor-based business who supplied the evenings’ coffee; their Colombian Supremo has Chocolate, Caramel, and fruit notes in the mouth and its smooth, well balanced flavour provided the perfect finish to the meal. Our guests reluctantly drifted home in taxis and The Man Bird and I chuckled at the sheer amount of glassware and empty bottles on our dining table. The next morning would bring some sore heads for sure, but what a superb evening we’d all had. La Belle Assiette is definitely the way forward in terms of hosting dinner parties; there’s absolutely no hassle at all for the hosts, which means you get to spend more time with those you love and there’s no mess to deal with afterwards (other than drinking glasses). What’s not to love? It’s so easy to get in touch and book yourselves a chef; contact them at www.labelleassiette.co.uk to arrange your perfect party.